Smallest 3D coil in the market epoxy encapsulated. 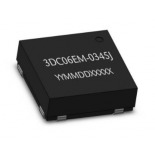 Newer designs in KES and mobile applications require smallest sizes in this passive component and still a long reading distance together with higher reliability. 3DC06EM offer upgraded possibilities due to the extra protection that the Epoxy molding gives. - Same sensitivity in the three axis.